England boss Roy Hodgson has hit out at the scheduling decision that will see the NFL match between Jacksonville Jaguars and Dallas Cowboys hosted at Wembley just six days before his side takes on Slovenia in a Euro 2016 qualifier. I imagine England fans would be quite happy to see some football played at Wembley for a change. Recent performances from their team have hardly set pulses racing and it’s been widely acknowledged that their qualifying group is a little lacking in box office. Asked about the situation with the NFL game Hodgson said: “I don’t really think you could expect me to say ‘excellent, delighted, well done.’” Funnily enough, he hasn’t offered that assessment after too many England games either. England are strolling to Euro 2016 and while Hodgson is understandably miffed at the FA’s priorities, this decision is not likely to cause his team too many difficulties. He notes that the pitch “is not in the best of nick” but that would be more of a concern if he favoured a free-flowing style of football. The World Cup demonstrated that the England team is hardly in the best of nick right now. Just over 40,000 fans turned up for England’s friendly with Norway in September. Considerably more will be in attendance for the NFL game. It’s rather strange to have, even temporarily, football more popular than soccer at Wembley of all places. The FA have made clear that they can’t take England games to other grounds in other parts of the country until the debts incurred from the construction of the new Wembley are paid off. 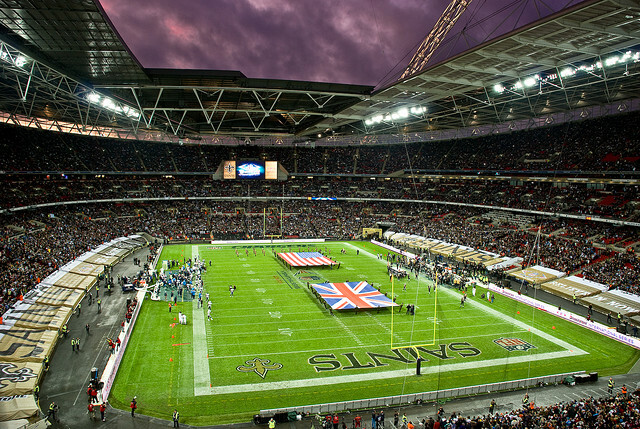 For now that looks like more NFL games and more England matches played in a half empty stadium. Criticising a man for using an umbrella to shelter from the rain seems harsh to me (it was absolutely pouring that night) but such is the level of absurdity that surrounds the position of England boss. Once the NFL game finishes, the ground staff will step on to the turf to begin repairing the holes in the pitch, as the FA takes another step toward repairing the hole in its balance sheet.